Hi there. 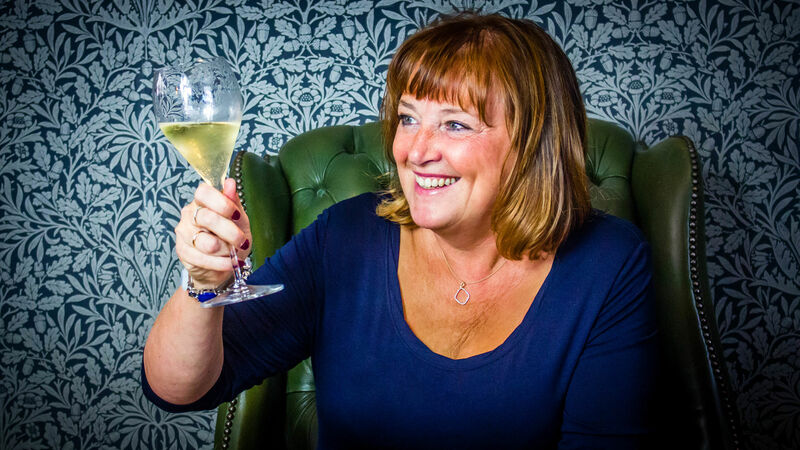 I’m Jane Clare, WIne Writer and Blogger – and now a wine Entertainer! What happened? 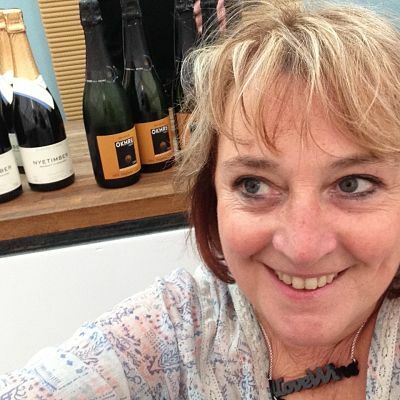 How did a journalist of 30 years’ standing (most of them sitting, to be fair) head down this journey of discovering wine and then decide to take a left turn into freelance writing, events and wine tastings? In 2011 I caught the wine bug when I visited Chablis on a press trip and was hooked. I wanted to discover more about wine. I launched the column One Foot in the Grapes in the paper I edited, the Wirral News, with the emphasis on learning about wine. The lovely Gray Simpson (Wine is Wonderful) mentored me in those early stages. He is now the wine, beer and spirits buyer for Whitmore & White in Heswall, Wirral. When I moved roles the column ended but in 2012 the Features’ Editor of the Liverpool Post asked me to write their wine column. I started the One Foot in the Grapes blog to share the columns published in the Post (a paper which is sadly no more) and you can see some from those early days in this blog. The wine column then moved into the Saturday Extra magazine, which is published in big city regional titles across the UK, including the Liverpool Echo, Newcastle Chronicle, Birmingham Mail and the South Wales Echo. A couple of years later and now even more papers publish my weekly missive – including the Nottingham Post, Hull Daily Mail and the Cambridge News. 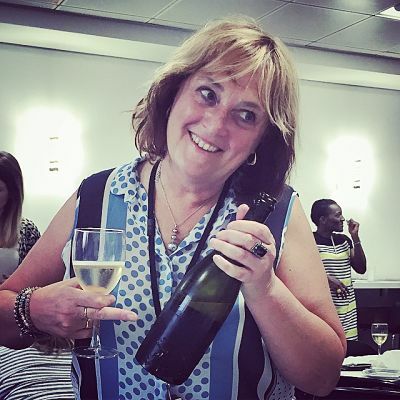 When I started out I didn’t feel I could write about wine with complete confidence so I enrolled on a couple of courses with the Wine and Spirit Education Trust. I received a distinction in the Level 2 WSET exam (Wine Spirits and Education Trust, www.wsetglobal.com) and a merit at Level 3 (Advanced) both through the Liverpool Wine School (www.liverpoolwineschool.co.uk) under the guidance of Dan Harwood. I’m now studying for the WSET diploma which is a two-year course for wine professionals. Errrrm. It’s challenging!! I’m also a member of the Circle of Wine Writers. In May 2017 I switched careers. I’m now branching out into running wine tastings in Merseyside, Sefton, Lancashire, and Bolton under the One Foot in the Grapes name to share the love of wine. I really love wine. I want everyone to love wine. I’m also continuing as a freelance journalist and it’s looking very exciting. The readership of that original column has grown; it is now syndicated to more than 30 Trinity Mirror regional newspapers (see list below). I’m very lucky. Do you fancy taking The Fizzics Test? 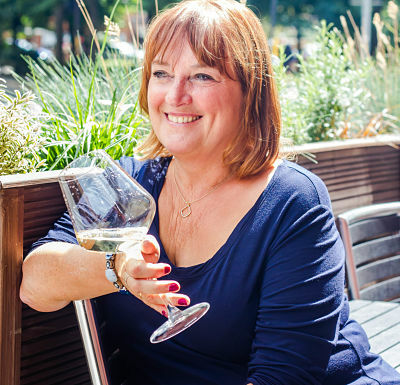 If you want to take The Fizzics Test, (yup, fizz fizz fizz all the way) or enjoy Supermarket Peep (a dalliance with some supermarket wines) or pick up some tips on white wine alternatives to pinot grigio then get in touch. I’d love to share my love of wine with YOU. I’m not geeky, oh no, don’t be scared. I once won a stand-up comedy night for goodness sake. I managed to stand up because I wasn’t allowed a drink until AFTER I’d been on stage. It’s funny how wine has totally changed my life. Who’d have thought. I bloody love wine. That’s about it really. It’s not rocket science. You can read my blog here. 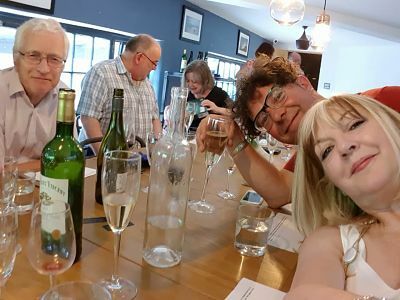 We have really enjoyed this wine tasting and have been able to learn quite a lot about different wines and the history of the Cunard shipping line. We absolutely loved the story of the cruise liners and their routes from Liverpool (with anecdotes). Peter was a wealth of historical local knowledge and we also loved learning from Jane’s experience of wines from around the world. Loved everything and very knowlegeable. A great evening and especially loved the port! A fabulous afternoon. 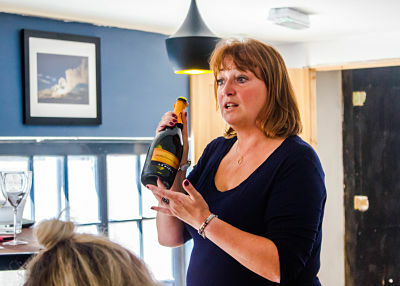 Jane makes wine-tasting fun and not stuffy and posh! We all loved the First Football Widows Fizz Club Jane, you were very informative, knowledgeable and FUN!! Have had a great time, very informative – and I’ve found my Christmas wine! Great afternoon tasting fizz and learning about the differences between cava, champagne,prosecco etc. Good tips for cheap tasty buys at local supermarkets. Very entertaining! Looking forward to the next one. Fabulously entertained and beyond expectations! Learnt lots about wine and what to look for in a wine. Our wine club had a brilliant evening with Jane. Good fun and informative too! 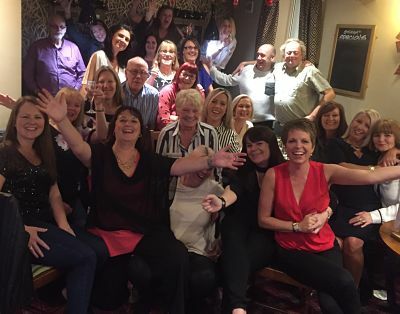 What a fabulous wine event at The Finishers in Bolton last night, we really enjoyed it from start to finish and I heard nothing but positive remarks all evening. Jane you’re a natural ! Here’s a selection of One Foot in the Grapes wine tasting event packages. I’m based in Merseyside but travel further afield. Prosecco is the in-thing, there’s no doubt, but do you know how to spot a better style of prosecco when you see it? Did you know cava and crémant are made in the same way as champagne? Do you understand the difference between a vintage fizz and a non-vintage fizz – or how to spot on a label which wines are dry, which are sweet? I’ll will lead you through a wine tasting of six different styles of fizz and we’ll select wines you’d be able to buy in supermarkets. This wine tasting event can be held in your home or One Foot in the Grapes can help to plan it in a local venue. A jolly jaunt tasting six supermarket wines. One Foot in the Grapes will choose two fizz, a white, a pink and a red wine, and will round off proceeedings with an award-winning dessert wine. The wines – all in the shops for £10 or under – will be among the seasonally-best choices at the time of the event. They’re good for your pocket too. It’s really easy to keep on buying the same red wine or the same white wine … but don’t be a slave to what you know. I’ll encourage you to pour new flavours into your wine glass. We can have a chat about your Wine Personality and decide if you’d prefer a red or white event; and then One Foot in the Grapes will create a tasting experience of five glasses of wine from around the world. This is a totally flexible event by name – maybe you’re a golf widow, a beer widow or a fishing widow!! It’s a quick and easy tasting of four glasses of fizz so you can spend your time doing what YOU want to do with your friends, while others in your life enjoy THEIR hobby. If you have pals or workmates who fancy a bit of a challenge then Call My Bluff is for you. One Foot in the Grapes will provide five mystery wines and each will have three descriptions. Can you guess which is the correct one? You’ll divide into teams and the winners will share a bottle of fizz and the bragging rights. One Foot in the Grapes’ wine tasting events are suitable for a hen night or a girls’ night in (or out!!) with a difference. We can also plan something around what YOU fancy. Just get in touch. One Foot in the Grapes hosts seasonal events for Christmas, summer, Valentines and so on. You can follow One Foot in the Grapes on Facebook to keep up to date with dates as they are announced. If you have ideas for your own event contact One Foot in the Grapes for details and together we can plan something to tick your wine boxes.